Acura's design language has reformulated its grammar for 2019. Thankfully gone is the battleship prow that has characterized all Acuras of the recent past. 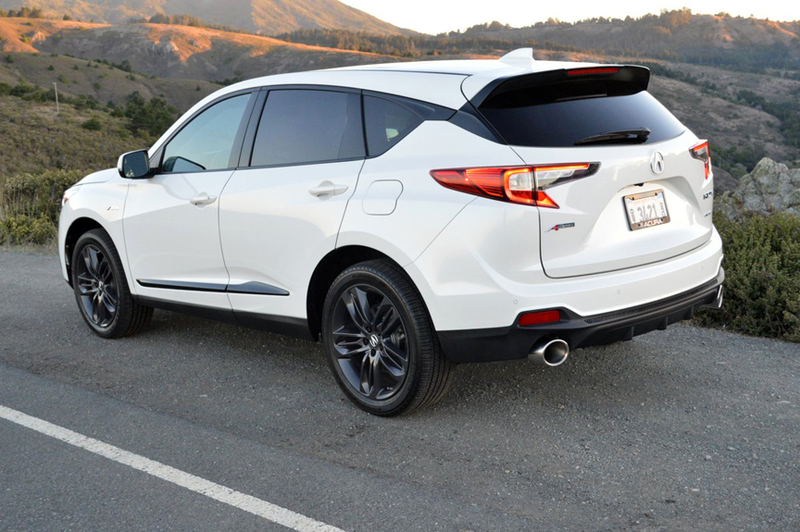 Instead, the minimized prow of the RDX now cleaves the air with a purposeful cleanliness that has been absent for too long. The latest RDX sports minimal overhangs front and rear, "Jewel Eye" LED headlamps that really blaze a trail at night, and complex LED tail lights to match. If you opt for the A-Spec package, even more designer tweaks highlight exterior appearance. For example, contrasting color spears separate the rocker panels from the upper body contours. These impart a sense of forward motion even when the RDX is standing still. A-Spec also includes striking and comfortable leather sport seats featuring contrasting color Ultra Suede inserts. 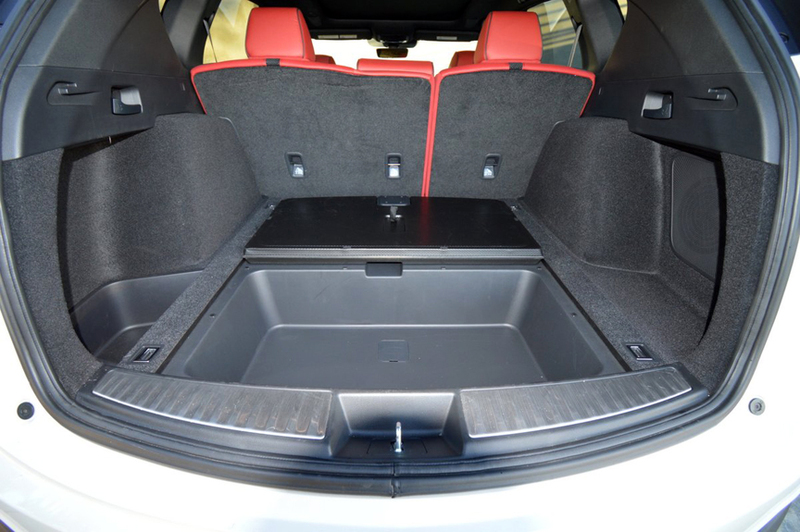 The front-seats are both heated and ventilated and offer 12 way adjustability. Acura's A list package also includes a knockout sound system called "ELS Studio" that provides "3D" entertainment through a network of 16 speakers. A pre-recorded USB music stick provided by Acura greatly enhanced our drive time in the RDX. The ELS system reproduced unforgettable tunes with such clarity that we mistook the RDX for a concert hall. A-Spec isn't just entertainment frivolity, however, since Acura includes a substantial wheel/tire upgrade as part of the package. At each corner, 20 inch diameter, 10-spoke black alloy wheels support 255/45R20 Goodyear RS-A tires with a Treadwear rating of 260. 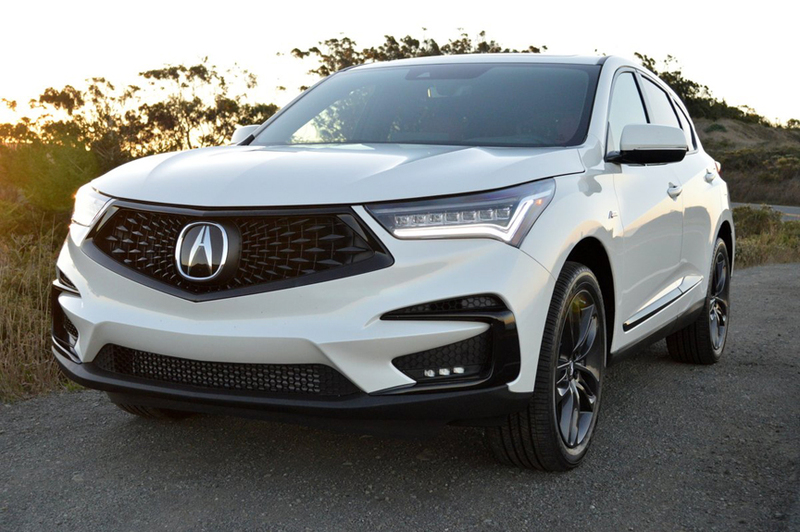 These aggressively compounded Goodyears work well with the stiff spring rates and anti-roll bars Acura has selected for this SH (Super Handling) version of the RDX. You can coax the best performance from the suspension's stout basic building blocks by opting for "Sport" or "Sport+" handling. Just twist the mode control dial on the center stack to the right for Sport and further to the right for Sport+. Either of these settings results in more precise steering feedback plus a stiffer ride that defies lean in tight turns. In Sport+ mode, the RDX, with all-wheel-drive (AWD) meting out traction to all four wheels, makes a solid case for top echelon sporting performance. The RDX' all-new True Touchpad Interface (TTI) controls virtually every important cockpit function aside from transmission shifting. TTI marks a revolutionary redesign of cockpit management. Instead of the touchscreen, which has become ubiquitous in most new vehicles, Acura has opted for a system that eliminates the finger pointing or mouse maneuvering that so bedevil motorists today. Instead of touching a fingerprint smudged screen or locating a cursor via a mouse pad, the TTI layout places a large rectangular screen at eye level, high on the top surface of the dash. This screen obeys commands you issue via a small finger pad located on the center console, just aft of the shift mechanism. The finger actuation pad contains 8 pressure points which relate to 8 segments of information you see on the vertical screen. Push lightly on the appropriate pressure point and you illuminate a command segment on the larger screen. Push harder on the pressure point and you actuate that command. Acura calls this interface "Absolute Positioning" because the "one to one mapping allows you to keep your eyes forward and use the system just as you would with a touchscreen interface." You can also customize the system by selecting favorite phone numbers, radio and musical choices and implanting these on your home screen. You then use the touchpad to cue each choice. For even less hassle, you can make your selections via voice command by pressing the appropriate button on the left steering wheel spoke. The voice system has been reconfigured to accept natural language voice commands like "Take me to.." or "I need to find a..." We found the True Touchpad Interface to be initially confusing to operate, but could see that the potential for a smoother relationship would come with greater familiarity. The RDX boasts a stout, 272hp, turbocharged, 2.0 liter, inline four cylinder engine mated to a sweet shifting 10 speed automatic gearbox. You can extract maximum grunt from the efficient, 23MPG overall powerplant by pressing the "D" button for drive twice and using the steering wheel paddles to control up and down shifts at your choosing. Acura's reinvented push button shift layout works better in the RDX than it does in the sedans or other SUVs I have driven from Acura/Honda. This is because, for the first time in my memory, the shift unit is inclined at an angle rather than lying flat on the console. This inclination makes it much easier to see what you are doing, and demands less of your concentration for what should be a relatively simple operation. LEARN MORE: The Most In-Depth Acura Consumer Research - Anywhere!